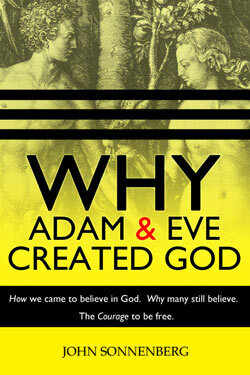 This book, Why Adam and Eve Created God answers this question. There are many reasons people do believe in God, and some of the reasons they think make them believers don’t matter at all. 1. They were born into a family of believers. This is the #1 reason that people believe in their God. Children who are told by their parents that they must believe in God, usually believe in God their whole life. Believers raise families of believers. Look at the statistics around the globe, and you will see how true this is. A child born in a county that is predominantly Muslim, will grow-up Muslim. The same goes for Hindu, Christian, and all other religions. People born into countries with few believers are unlikely to become God-fearing. 2. Living in a society of Believers. Once born into a faithful family, if the local community holds the same beliefs, it is very difficult to do anything but believe. With friends, family, and the community all believing the same thing, the social and emotional pressures are too great for most normal people to simply ignore or go against. 1. Living in a society of Believers. With friends, family, and the community all believing the same thing, the social and emotional pressures are too great for most normal people to simply ignore or go against. 2. They believe they are right. The religions of the world do a great job keeping their followers miss-informed. Muslims think they are right. Catholics think they are right. Lutherans think they are right. Everyone is sure that their faith is justified and the rest of the world is misguided. How do I know I am right about this or simply misguided as well? Well because everyone can’t be right. It is simple logic that with thousands of different belief systems in the world, they can’t all be correct. I spent years researching which faiths are well-founded. Why Adam and Eve Created God documents my research, and in it you will see that there is no religion in the world that is well-founded, reliable, or any better than any other. 3. If feels good. Believing you are right feel good, and admitting a lifetime of lies is very painful. There is little support for the person who wants to abandon a belief in God. In many communities, there is a price to pay for even considering leaving the faith. It was not that long ago, it was a crime to change religions or abandon a belief in God. In some countries, it is still a crime. Believers are taught so many things that make them comfortable and want to continue their faith; they are especially blessed; God blesses their country; their family prospers because they believe; they will go to heaven when they die; God is protecting them from evil, disease, weather, disasters, and famine; God gives them their daily food. With a firm belief that God does all this and He cares about a single individual amongst the billions of planets, many people simple feel too good about their belief to question it. And why question it? Living in a society with similar beliefs, there is little reason to change. 4. It is difficult to not-believe. There is a threat of eternal damnation if you dare question its basic truths. You were taught this from the day you were born. This is what kept me so long in my religion. Religion thrives on human basic fear of the unknown afterlife. Not only does the believer fear eternal damnation, but most of their friends and family feel the same way. After a life-time of being told about hell, fearing hell, and comforting themselves and others that they are not going to hell, it is very hard for any believer to say they were wrong. It means denying their core beliefs, offending friends and family, and risking becoming an outcast in their own home. The emotional penalties are so high, many do not want to risk enduring them. Its just easier to believe, or at lease pretend to believe.